Kari came, she saw, created and totally conquered! I was so impressed with the way she took every aspect of the surroundings, soil make up as well as my needs into consideration to come up with her design. The expedition of the work was well planned and exceptionally professional. Thank you for creating my own little slice of heaven right in my back yard. When I moved into my new town house in Kingston upon Thames, the small back garden (5 metres by 10 metres) was overgrown and ugly and I requested Kari Gro Beardsell to develop a new design, albeit with a very limited budget. Kari’s design included re-laying the existing flagstones in a pattern at 45 degrees to the house, and a picket fence with gate at the bottom of the garden, which backs onto a golf course. The intent was to convey a sense of depth, thus making the garden look bigger. Kari also recommended the planting scheme and the positioning of obelisks etc. Although the contractor who undertook the work was initially extremely sceptical about the proposals, once it was completed, he liked it so much he took numerous photographs for use on his website, with no doubt a view to plagiarizing the design on future projects. I’ve also been complemented on the new look of the garden by many of my neighbours, and even a few of the passing golfers! I would like to express my enormous gratitude to Kari Beardsell for the excellent result achieved with her intervention which has transformed completely the way my family and I live in the house. Thanks to Kari’s excellent design works, some part of the garden that were overlooked by our neighbors are now protected by trellis and flowers, the patio deck built in the garden has allowed us to use extensively the rear of the house. The selection of plant and flowers has been extraordinary; we have been able to appreciate both the variety and the diversity. What was the ugly backyard of the property has become instead the most enjoyable. Last but not least, the idea to rearrange the slope with the use of steps and “aiuole” has been extremely appreciated because the garden now looks bigger and better. Job well thought and implemented, I will recommend Kari’s service to anyone because she has showed, competence, inspiration with her design ideas, and management skills in making sure the job was done to specification, on time and on budget. I look forward to employ her again when I am going to move to my next property, hopefully with a bigger garden. Please feel free to contact me if you would like to discuss further the job she has done in my garden. The April meeting of Clanfield WI enjoyed an interesting and stimulating talk by, Kari Beardsell, on Garden Design. Kari took up garden design following a move to a house with a large garden and has now made it her second career. Her knowledge and skills have advanced at such a pace that she has had a garden design plan accepted for the prestigious RHS Hampton Court Garden Show. Kari explained how her design is inspired by the colours of the rainbow, and described the evolution of her design through line drawings and computer generated diagrams. It is fitting therefore that the nominated charity for her design is the Rainbow Trust. We also learned from Kari the importance of balance and proportion when planning a garden as well as ensuring that the garden harmonises with the house. 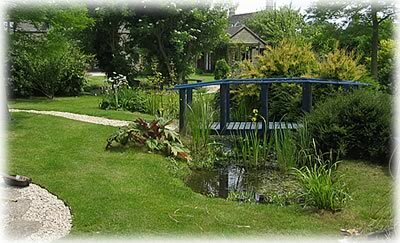 Kari gave us many tips on how optical illusions can be created through careful planning and use of colour and illustrated her talk with many examples of wonderful gardens by famous designers, including the local garden at Buscot Park by Harold Peto. We all came away with great plans for our own gardens and wish Kari every success. More are available on request.